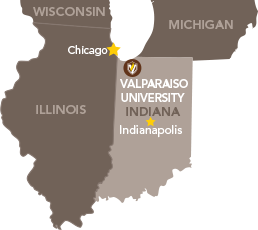 Professor Andrea Jamison recently joined Valparaiso as a Diversity Fellow and Lecturer. Before joining the Christopher Center, she received her Master of Library Science degree from Dominican University School of Library and Information Science in River Forest, Illinois. Her major included a focus on school libraries and youth services. She is currently completing doctoral work in Information Studies at Dominican University. Her current research involves examining the marginalization of African Americans in children's literature. Professor Jamison has over 17 years of experience working in schools and libraries. She speaks internationally on issues related to creating inclusive learning spaces for youth and the interplay of race, power, and privilege in children's books. She was recently selected as a reading ambassador for diverse children's books by Lee and Low Publishing. In addition to her current duties at Valparaiso, she also reviews for the School Library Journal and serves as chair for ALA's Ethnic & Multicultural Information Exchange Roundtable's David Cohen/Multicultural Awards. Prof. Jamison previously worked as an adjunct reference librarian at Prairie State College. Creating Windows to the World: A Discussion of Why Diversity in Books Matter More Today Than Ever Before, San Jose State University iSchool: School of Information, July 2018. Using Coretta Scott King Award - Winning Books to Enrich Programs and Instruction in Public, School, and Academic Libraries: ALA's Coretta Scott King Awards Committee: Invited panelist, American Library Association Annual Conference, June 2018. Bridging the Gap: Why Diversity Still Matters, Bibliothekartag: Invited speaker, German Library of Congress in Berlin, June 2018. Using Diverse Books to Enhance Reading, AISLE (formerly Illinois School Library Media Association): Presenter, AISLE's Annual Conference, November 2017. Diversity: Why it Still Matters, Salt Lake County Public Library Systems, Staff Professional Development Session: Invited Speaker, Salt Lake City, Utah, October 2017. Diversity: Why it Still Matters, ALA's Ignite Session: Presenter, American Library Association Annual Conference, June 2017. Faith, humanitarianism, social justice, music, writing, and film. Professor Jamison lives with her son, Justice. They share an affinity for Marvel superheroes, traveling, and dessert.